Support Home Paya Virtual Terminal How To How do I customize the receipt in the Paya Virtual Terminal? How do I customize the receipt in the Paya Virtual Terminal? 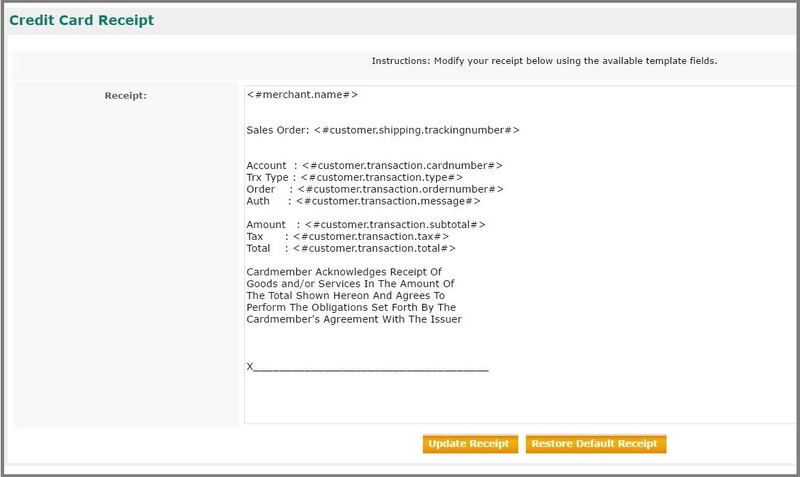 To customize the receipt in the Paya Virtual Terminal, follow the steps below. 1. In the Paya Virtual Terminal, go to Configuration, then Receipt. Choose the type of receipt you would like to customize. 2. Edit the format of the receipt in the Receipt field. Note: Use the Template Fields section on the bottom-left of the page to insert information unique to each transaction that is processed. You can insert the necessary template field by copying the link, then paste the template field into the Receipt field. If you want to show the customer’s name on the receipt, copy “<#customer.billing.name#>,” then paste it where you would want the customer's name displayed on the receipt. If you would like the last 4 digits of the customer's card number on the receipt, copy "<#customer.transaction.cardnumber#>,” then paste it where you would want the last 4 digits of the customer's card number displayed on the receipt. Note: It is not required to include template fields on your customer's receipt. 5. To return the receipt to its default format, click Restore Default Receipt. Note: Once you change the format of the receipt in the Paya Virtual Terminal, the changes will be applied to all receipts in the transaction history.